And they loved them so much they are wearing them to bed tonight! 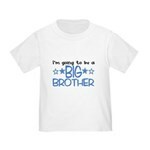 With so many choices available, its so hard to pick the perfect t-shirts to let your kids announce your big news. And they’re always so proud to be able to show off their upcoming sibling. I searched and searched. I wanted matching shirts, but needed a shirt that made my older son a big brother again. I purchased these from Cafe-Press, where there are hundreds of choices. Created by Just My Dream, I liked these because they were easy for the kids to read the words (we told them our news by having them read their new shirts outloud) and they’re simple with a little extra in the stars. A seasoned online t-shirt buyer, I ordered a size up and the shirts fit. Just hoping the 4T doesn’t shrink too much… this shirt needs to last through the summer! Yay! Congrats! The boys must be so excited!